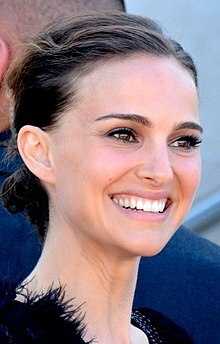 Natalie Portman (born Neta-Lee Hershlag[a] on June 9, 1981) is an actress, film producer and director with dual Israeli and American citizenship. She is the recipient of several accolades, including an Academy Award and two Golden Globe Awards. Portman made her feature film debut as the young protÃ©gÃ©e of a hitman in LÃ©on: The Professional (1994). While still in high school, she gained international recognition for starring as PadmÃ© Amidala in Star Wars: Episode I â€" The Phantom Menace and received critical acclaim for playing a precocious teenager in the drama Anywhere but Here (both 1999). The Star Wars prequel trilogy concluded with Star Wars: Episode III â€" Revenge of the Sith (2005), following which Portman portrayed a wide variety of roles. She played Evey Hammond in V for Vendetta (2006), Anne Boleyn in The Other Boleyn Girl (2008), and a troubled ballerina in the psychological horror film Black Swan (2010), for which she won the Academy Award for Best Actress. Portman's directorial ventures include the short film Eve (2008) and the biographical drama A Tale of Love and Darkness (2015). In 2008, she served as the youngest jury member of the Cannes Film Festival. Portman is vocal about the politics of America and Israel, and is an advocate for animal rights and environmental causes.